That multi-band facility, rare in a pedal, could make this your go-to compressor. MB mode opens up interesting opportunities. 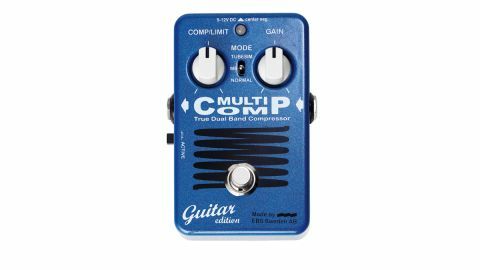 The MultiComp is a guitar compressor that offers you a choice of solid state (Normal), tube simulation (Tubesim) and multi-band (MB) compression modes. All three modes are easily set up with knobs to turn up the compression and set the output gain, with the pedal's LED handily growing brighter to indicate when you are compressing, and how hard the level of compression is. When it's in Normal mode, the Multicomp offers clean compression from a mild smoothing to a squashier vibe, with an increase in note snap that's just right for country picking, all with spare output gain to drive your amp a touch if desired. Tubesim offers more of the same, but adds a tickle of pleasant harmonic distortion to the mix. Most interesting, however, is the MB mode where the bass and treble compressors work independently so neither end of the spectrum unnaturally affects the other. Individual threshold levels can be fine-tuned with internal trim pots, allowing you to, say, keep the sound on your bass strings tight while the top end is less molested.